Bring Your Appetite to Hudson’s in Marquette! Looking for a classic restaurant to enjoy with the family? Hudson’s offers it all. If you’re looking for friendly service and great food at a sensational price, you’ve come to the right place. At Hudson’s we are proud to offer family-style meals—a terrific full lunch and dinner menu variety and a kids menu for easier selection—all while listening to classic rock and roll. 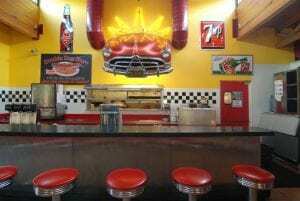 Home of Burgers, Shakes, and Rock’n’Roll! Enjoy watching your favorite team at our Full Bar on one of the many TV’s.